This month, I wanted to create a more visual favourites post. I started watching a live Instagram video the other day by one of my favourite artists that I’ve found online (Iamnoyes on Instagram). I asked her a few questions during the video, and it turns out she uses the same tools and apps that I do. So, this inspired me to create a more a (digitally) hand drawn favourites post with my Apple Pencil right away. Even since I’ve started experimenting with the Apple Pencil, I’ve improved and changed my technique and the brushes and marks that I use. I would have included the it in my favourite but I have had it for a few months so have been using it now and then, so it’s not exactly a monthly favourite of mine. But I definitely plan to write a blog post just about it in the future. In December I made sure I planned time for myself. Work has been crazy busy lately and there are a lot of structural changes happening meaning we’re short staffed and if you’re not careful stress can set in. Throughout the month i was making sure i dedicated time to doing hair masks, gel nails and taking long hot bubble baths. Self care is so important and its nice to just take time out from the world and have some peace and quiet on your own at times. Ive recently done a number of posts about how i’ve been getting back into being totally and fully artsy. Ive been doing a lot more painting and creating in recent months and in the run up to, and all throughout December I was super busy getting crafty. Calling all glue guns, tweezers, pens and pencils, scissors, materials and anything i can get my hands on!! I was so busy creating christmas decorations and ornaments and gifts for friends and family, i loved it and its something I’m definitely going to continue to do. I’ve been doing pretty well keeping my blog up to date lately, and it’s important to me to make sure that I always write about things that I can talk about, not just put content out there to fill a space. At the beginning of December I wrote 4 blog posts in a day. I don’t know what happened but I just had so many ideas flowing and I had to write them down and evolve those ideas. 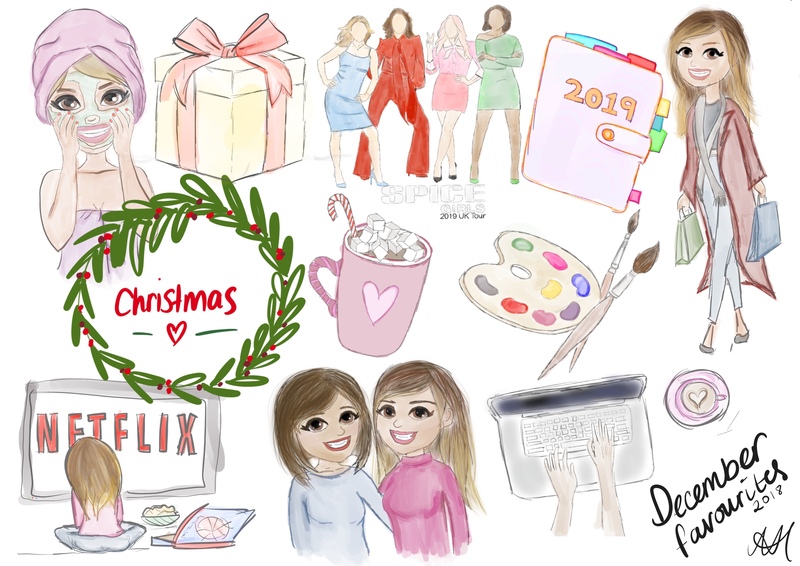 This was ideal really, because December became so full of meet ups, parties and crafty time for me, that I doubt I would have had a lot of spare time to dedicate to blogging If I hadn’t had that burst of ideas that one day. Christmas is one of my favourite times of year. I love cosy jumpers and thick woollen tights, cute hats and scarves and the odd excuse to stay in and do nothing just because ‘its cold’. I love the build up to christmas too, the decorations, the festive spirit and music that you hear 50 times a day in the shops in town and the general festive cheer that most people seem to adopt. With the Christmas festivities comes gift giving and reflections on the past year. I spent a fair bit of time in December catching up with friends, having fun nights in and out out too, and exchanging lovely gifts. Spending time with friends is so important to me because they’re like my family. There is nothing we don’t talk about, and having a solid group of individuals that have got your back and will stick by you in the toughest of times is such a blessing. Obviously with the cold weather setting in it means that its totally acceptable to have Netflix marathon days and watch all those cheesy holiday films that you really wouldnt normally bother with? This year I watched The Princess Switch on Netflix starring Vanessa Hudgens as an American baker. She travels to a fictional country in Europe and then somehow swaps places with a member of their royal family who happens to have an awful British accent. Terrible film, but worth a watch! I also discovered the Netflix original Dumplin’ which is b.r.i.l.l.i.a.n.t, and three new series, called Set It Up, You and The Alienist. All very VERY different but I’d recommend all of them . I’m also still dipping in and out of Mad Men at times. I think I’m on season 6 at the moment… but I don’t want it to end! OH. And I also saw The Greatest Showman for the first time. I can’t believe I’ve gone so long without seeing it.. I’m now obsessed. Another thing about the end of the year means that your thinking about ‘next year’ and what plans to make. Luckily, I already have quite a number of fun events to look forward to for the first half of 2019, but it’s fun to plan with your friends for upcoming trips and Birthdays. Last year I asked my friend to get me a diary/ planner for Christmas and I can’t live without it now! I also asked for one this year and as silly as it sounds, you really do feel so much more organised when you physically write things down and don’t just keep them in your phone calendar. So there you have it, my favourite things for the month of December! What were your monthly favourites?? all drawings by me – obviously. Previous Who really sticks to a New Year’s resolution anymore?